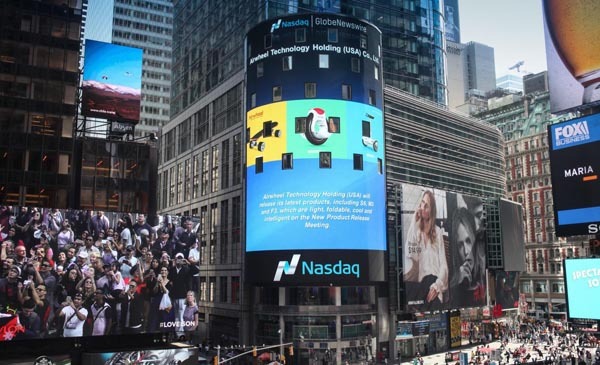 Abstract: Airwheel new product is appearing on the NASDAQ billboards on September 29th, 2015. It shows that Airwheel Technology is going to release its new products in order to satisfy consumers’ demands. A great number of people gather in front the advertising screen to watch the notification of Airwheel New Product Release Meeting on September 29th, 2015. From the above picture we can see that on the big screen it reads Airwheel Technology Holding (USA) will release its latest products, including electric scooter S6, M3, and F3. At the moment words scroll out on the screen, we can clearly make out that all pedestrians stop expecting new products created by Airwheel. Some people take out their cellphone to record the exciting moment. Maybe they say it’s so cool Airwheel develops its new scooters and I can’t wait to buy another one. In other words, it’s because of Airwheel’s charm and good reputation to stir up a hit in the NASDAQ plaza. Before it has released self-balancing scooter Q series and X series which are quite epidemic among Americans and Europeans. So what kind of pleasant surprise will those new products bring us? Let us in advance to feel the new products. First we go to introduce M3 electric skateboards which looks like a normal skateboard in term of its looking. However, it’s more than a skateboard for it has more driving force from the battery and it can challenge various rode conditions which gives rider diverse sliding experience. Second this F3, the one-wheeled scooter with light and solid materials lets walk out much easier. Because its mini exterior can be carried around without efforts, rider can go wherever. Besides, the design concept of F3 that is concise without losing fashion conforms to most young people. In regard to S6 with an adjustable seat cushion. For some people who are tired of standing when riding this two-wheeled electric scooter can extend out the support bar until the height is suitable and comfortable to sit and ride. Moreover, S6’s pedals are anti-knock and reducing pressure.